Why Choose Olewo Red Beets? The addition of a small amount of vegetables to our dogs' diets can have a significant impact on their health because vegetables are a great source of fiber and contain many health-protective phytonutrients which are ONLY found in plant material. Not all vegetables are equal when it comes to nutrients and benefits they provide. Since dogs should only get a small amount of vegetables in their diet, it is important to choose nutrient-dense vegetables like red beets (red beetroot) that provide a lot of nutrients in a small serving. Red Beets are a true powerhouse when it comes to the nutrition they provide and they have amazing healing powers. Red Beetroot is truly one of the most powerful foods to help the body detoxify, and to help promote healthy inflammatory responses - naturally! Toxins and inflammation are the beginning of all disease. That's why we call the Red Beet - The Root of Cleansing and Protection. Olewo - the ORIGINAL Red Beet Product for Dogs! The Olewo company in Germany was ahead of its time when it developed the first Carrots for Dogs more than 40 years ago when natural foods for pets were not common. As a trendsetter in natural products, in 2003 Olewo started making the first Red Beets for Dogs. 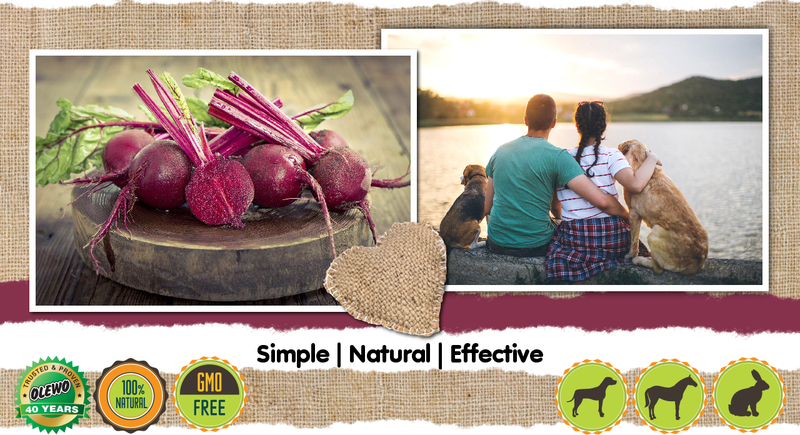 At that time, and even today, the miraculous benefits of red beetroot for the health of our pets are not commonly known. The Olewo manufacturer had the product tested by a Scientific Lab to document the great, but little known benefits of red beetroot for pets. This is NOT Beet Pulp! Beet pulp comes from sugar beets which are grown specifically for the production of refined sugar, and are generally not eaten as a vegetable. The beet pulp is the byproduct from commercial sugar processing because after the sugar is processed and removed, the pulp is left over. Beet pulp is mostly known as an ingredient in horse feed, but in recent years pet food manufacturers started adding it as a source of fiber and filler to dog food. While the fiber in beet pulp is known to be highly digestible, it is lacking many important nutrients and does not have the healing powers of red beetroot. Olewo Red Beets are made from premium red table beets (red beetroot) that humans eat because of their many health-promoting benefits. This root vegetable, best known for its bright, red color has been enjoyed for generations as a healthy source nutrients and as the go-to vegetable for numerous health benefits - and dogs can benefit from this miracle vegetable just like humans. The unique phytonutrients in red beets provide more powerful antioxidant support than other antioxidant-rich vegetables. The combination of certain elements found only in specific combinations and concentrations within the red beetroot give this veggie it's disease preventing and cancer fighting powers. While our soils are depleted of trace minerals, leaving our vegetables deficient of vital nutrients, the vegetables used for Olewo Pet Food Supplements are grown in the extremely fertile soil of northern Germany’s flat terrain. This means that the fresh red beets used to prepare Olewo Red Beets have far more nutrients compared to red beets that are grown anywhere else. Like all root vegetables, red beets start loosing valuable vitamins and nutrients after they are harvested and are exposed to light, air and moisture. Not only does Olewo monitor the red beets as they are growing and harvest them at just the right time when the nutrient levels are at their peak, the vegetables also go to preparation the day they are harvested to avoid nutrient loss. Since the nutrients are fast diminishing each day after the beetroot has come out of the ground, your dog won't be able to reap the same health benefits if you were to prepare your own beets. You won't know how fresh the beetroot really is at the grocery store because you don't know how long the vegetables have been out of the ground. Depending on when they were harvested, were they were grown, and how long they spent in transportation, they may not be that fresh after all. When cooking red beets, the cooking process can break down some of the beneficial compounds within the beetroot. The color leeches if beetroot is cooked for too long causing all those benefits to leach out of the vegetable. For humans it is advisable to either eat raw beetroot or drink beetroot juice for best results. Proper preparation of the beetroot is the key to increase their digestibility so that dogs are able to absorb their many health-promoting nutrients. Dogs cannot properly digest raw vegetables! The issue with raw vegetables is that the vitamins and minerals are embedded in cellulose, a carbohydrate that is difficult to digest, and therefore dogs will not be absorbing the valuable nutrients. Most dogs enjoy eating raw vegetables, but the chewed pieces simply pass through their digestive system without being broken down, and without the nutrients being absorbed. If you ever take a close look, you can see the veggie pieces in the dog's poop just they way they were swallowed. We still give our dogs raw beets, carrots and other vegetables at times, simply because they enjoy eating them raw, but they receive Olewo Red Beets and Olewo Carrots in their meals every day for the health benefits. Since Olewo Red Beets are in the proper form and easy to digest, dogs are able to absorb and utilize the nutrition from this amazing root vegetable to benefit their health. The nutrients in Olewo Red Beets are retained until the red beet chips are rehydrated with a little warm water by the pet owner prior to preparing each of their dog's meals. The dehydrated beet product returns to a fresh food appearance with the a nutritional value that closely resembles the fresh red beets they are made of. Olewo Red Beets are very effective and results can typically be seen in just a few weeks and sometimes even in just a few days after incorporating the food supplement in your dog’s daily diet. Toxins are expelled form the dog’s system resulting in a quick cure from scratching and itching for dogs with skin allergies. The betalain pigments in red beets effectively neutralize toxins, which are often the cause of allergies. Red Beets also help manage a dog’s weight because they contain a gamma-amino acid, which plays an important role in maintaining efficient metabolism. Olewo Red Beets also provide long term results that are not as visible, such as increased antioxidant levels and a strong immune system, which also contribute to your dog’s health and help eliminate many of the common ailments and can even help prevent cancer. For complete Health Benefits and Uses, please see Olewo Daily Red Beets for Dogs. The vitamins and minerals from a whole food like carrots are much more effective than synthetic vitamins. The vitamins in synthetic products loose a large percentage of their potency when separated from its natural whole food family. The natural vitamins from a whole food like Olewo Red Beets are groups of related compounds that cluster in the food. They include extra factors like trace minerals, co-enzymes and antioxidants associated with the major vitamins and increase the ability of the vitamin to function. They are complete in the form your dog's body needs them and are easily absorbed. Synthetic vitamins do not include the extra factors, and therefor are not as effective, and can even lead to vitamin overdoses and imbalances in the dog's body chemistry. Kibble is the most highly processed dog food and the ingredients are stripped of their nutritional value. A synthetic vitamin mix of often sprayed on the food afterwards to replace some of the lost nutrients. The addition of Olewo Red Beets will significantly increase the nutritional value of the food. Even though wet (canned) food is a better choice than kibble, it is still processed food. Any vegetables that might be in the canned food would have a diminished nutrient content. Mixing in Olewo Red Beets will significantly raise the nutritional value of the food. Raw dog food that consists of meat, organ meat, and bones should be supplemented with Olewo Red Beets for the added nutrition and healing powers. It wouldn't make sense to feed your dog an all-natural, raw diet and then add synthetic vitamins. Olewo is the perfect partner for raw feeding. When preparing home cooked meals for your dog, it is very important to supplement to make sure the meals are complete with all the vital nutrients. Since you are going through the effort to cook for your dog, it wouldn't make sense to add synthetic vitamins. Olewo Red Beets are the perfect partner for supplementing home cooked meals with whole food nutrition. Olewo Carrots have been trusted and proven for over 40 years to be highly effective even in the long term when fed to dogs over many years of their lives and even an entire lifespan. While you can’t trust many of the new companies and new products on the market because they have no proven track record, you can trust Olewo with the health of your pets. 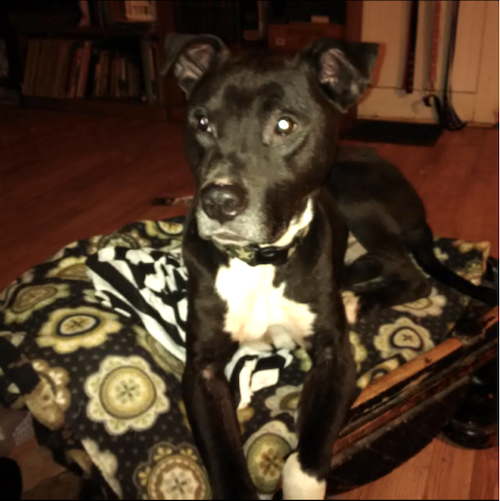 "This is my pit bull/whatever mix, BoBo. He suffers from allergies and would periodically break out with hot spots and constant, annoying scratching. I had no choice but to succumb to prescription steroids for his comfort and my sanity. But with the side effects of prescription meds, I did not want to continue with those, and decided to try something natural. As you know, trying to gain knowledge from reading on the Internet, everybody's opinion, it can be mind-boggling. I have to admit, I don't know what made me choose Olewo Red Beets. I think I just said to myself: Pick something and try it. It was the best decision I ever made for him. I made that decision about a month prior to this picture because he had a breakout all over his face, with only little spots of hair here and there, flakes of dry skin falling off, his ears inflamed, and sores from scratching. Unfortunately, I wasn't snapping pictures of him then so you could see for yourself. But this is what he looked like after about a month of Olewo Red Beets. Now, I must say I was loyal to the deed of making sure he received them every day. I didn't expect him to magically recover overnight, or just to remember to give the beets to him now and then. I was insistent about it and knew if this didn't work, it would be back to steroids. I stuck with it, and we haven't had any major breakouts for a little over a year, and his black coat is so shiny. BoBo and I say, YAY FOR OLEWO RED BEET ROOTS!" Please visit our Testimonials page for more feedback from our customers.